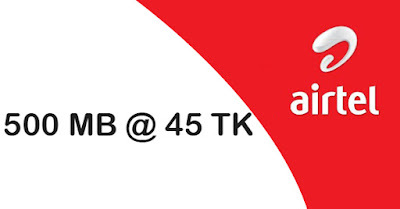 Welcome to Airtel 500 MB 45 Tk Airtel New Internet Offer.Airtel Bd always brings special internet pack for their customers, Now all airtel prepaid customers are eligible to enjoy 500 Mb internet at only 45 Tk.Just dial *123*045# to activate Airtel 500 Mb 45 Tk Offer. ➤ To activate dial *123*045#. ➤ Pack Price 25 Tk (inclusive of VAT+SD+Surcharge). ➤ Validity of Airtel 500MB@45TK is 5 days. ➤ All Prepaid customers are eligible for this offer. ➤ Balance check dial *778*39#. - After Internet Volume Expiration customers will be charged from main balance. - Offer will run until further notice. - All prepaid customers can purchase the pack as many times as they wish during campaign period.